The Wait object as it appears in the Toolbox. The Wait object is used to delay program execution for a specified amount of time. The Wait object may also be used to collect a response without requiring the overhead of an object presenting a stimulus (e.g., TextDisplay, SoundOut, etc.). 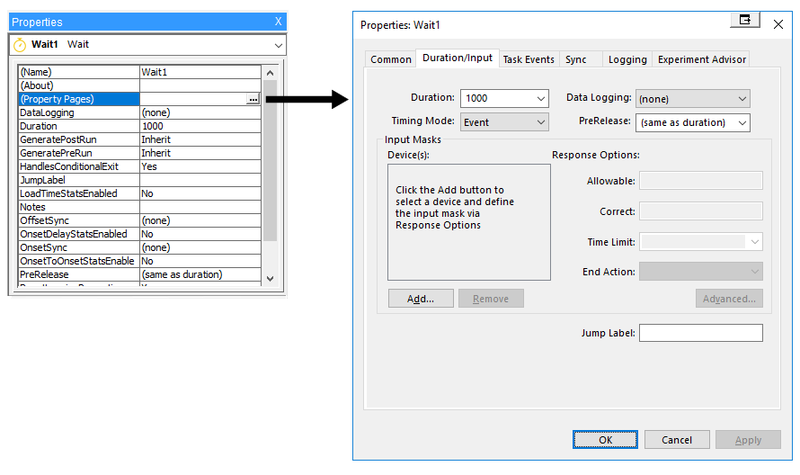 The Wait object does not have an interface through which properties are set. Dragging the Wait object icon to the Workspace, or double clicking a Wait object in the Structure view will open the object’s Property pages. The properties for the Wait object may be set using the Property pages. The Property pages may be displayed by double-clicking the Wait object in the Structure view, or by clicking the ellipses (…) in the Property Pages field in the Properties window. The properties specific to the Wait object are included in the table below. JumpLabel String values Identifies a Label object within the current Procedure to which program execution jumps when input is received on a mask that has an End Action of “Jump”. PreRelease Integer values Amount of time released during the processing of the current object to allow for setup of the next object.